The right features, performance, and price—Commander MAX Limited is built to take 4 people farther Rotax 100R power, a versatile dual-level cargo box, and rider-focused features perfect for whatever adventure means to you. 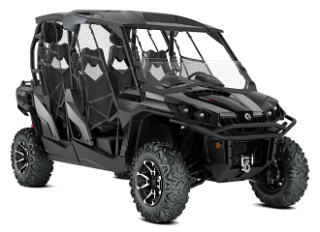 Can-Am partnered with leading GPS manufacturer Garmin to equip the Commander MAX Limited with an integrated touchscreen Montana 650T GPS. With a 5 MP camera, preloaded topographic maps, 4-in color display, barometric altimeter, 3-axis electronic compass, wireless data sharing, and more, it'll earn your trust far off the beaten path. We've fitted Commander MAX Limited with a heavy-duty front bumper for a beefier look and better functionality. Bed rails installed on the dual-level cargo box add more tie-down points for cargo carrying. Below, mudguards create an extra layer of protection for the occupants and keep debris where it should be.